David Harris was the first African-American to fly for a major passenger airline. Harris speaks about his experiences, sets the record straight and shares his message with young people. American Airlines presents Black History in Aviation. 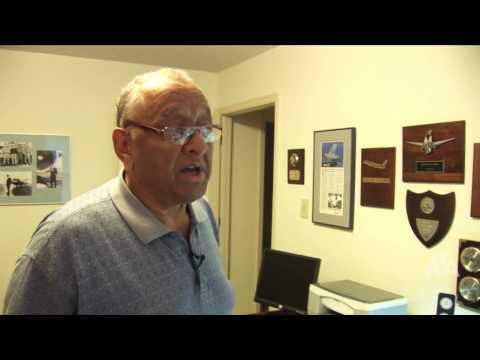 When David Harris left the U.S. Air Force in 1964 with the goal of becoming a commercial airline pilot, the skies were not exactly a friendly place for African-Americans. “I was perfectly aware that there weren’t any black pilots flying with the airlines,” Harris says of his determination to make a career in civilian aviation despite widespread discrimination. “I didn’t want to go with any airline that wasn’t really ready to hire blacks,” he says. Harris went on to enjoy a 30-year career with the carrier and in 1967 became the nation’s first African-American captain with a passenger airline. Today, his uniform, hat and other memorabilia are part of the Smithsonian National Air & Space Museum’s “Black Wings in Aviation” exhibit, and he’s the subject of a permanent exhibit at the American Airlines C.R. Smith Museum in Fort Worth, Texas. Since retiring in 1994, he has maintained his interest in aviation. He keeps a single-engine Socata Trinidad at his home in the Country Haven fly-in community, where, from time to time, he helps mentor local kids. That determination was tested when Harris entered the American Airlines pilot-training program. His roommate—apparently unaware that his colleague was African-American—would make racist remarks directed at others on a daily basis. Harris seethed but held his tongue and focused on why he was there. The dedicated young pilot’s career took off faster than the passenger jets he was flying. Harris rose through the ranks by working hard and taking advantage of every opportunity the seniority system offered in an expanding industry. While proud of his accomplishments, Harris insists that other black aviators get credit for breaking into commercial aviation at roughly the same time. When Harris joined American Airlines in 1964, Tuskegee Airman Perry Young Jr. was flying passenger helicopters in New York, and August Martin was a captain with a commercial freight airline. Another former military pilot, Marlon Green, might have beaten Harris to the milestone of first African-American captain with a passenger airline, but Green’s civilian career was delayed by a six-year legal battle with Continental to secure a flying position. “I applied at American, went to school and was flying before his case was finalized,” Harris says. When David Harris was flying nuclear-armed B-47 bombers for the Strategic Air Command during the Cold War, he was assigned to an air base in England where U.S. forces kept a wary eye on the Soviet Union. To keep the men sharp, commanders put the planes and crews through frequent drills. At the sound of a klaxon, Harris and his crew would sprint to their bomber, put on their flight helmets and await mission orders. When the radio crackled to life, the cockpit crew would decode and authenticate the message. Only then would the men learn if it was a drill, a training exercise or orders to go to war with nuclear bombs. While the airmen prided themselves on their preparation and rapid response time, they began to anticipate that each scramble was just another drill, but that wasn’t always the case. Despite their worries for friends and family, Harris and his crew fell back on their training. They strapped in, fired up the engines and taxied to the runway to receive final mission orders. Fortunately, the early warning signal that put the squadron on high alert was determined to be a false alarm, and after a few tense minutes that felt like days, the orders came to taxi back to the hangar.